Native Americans enjoyed a wide variety of entertainment in the form of sports, games, music, dance, and festivals. Different tribes and regions had their own games and traditions. One of the most popular Native American sports was lacrosse. This is still a popular sport today. 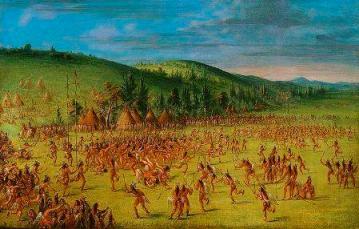 Different tribes had different names for the sport including stickball, bump hips, kabucha, and little brother of war. The game was played with a ball that was passed around using sticks with nets attached to the end. Sometimes the game was a huge event with hundreds of players on both sides and a field that was over a mile long. Games would often last from sunrise to sunset. The game was sometimes used to toughen up younger warriors and to settle disputes between tribes. These were brutal games with few rules. Players were often seriously injured. The Hand Game - The Hand Game was played between two teams of people. One side would pass around a small bone or ball quickly. Then the other side would try to guess who had the item in their hand. If they guessed correctly they gained a point. Then the other team would try to hide the item. Ring-the-Stick Game - The Ring-the-Stick game was usually played by children. They took a long stick and tied a string to one end. At the other end of the string a ring was tied. Then they would toss the ring into the air and try to catch it with the pointed end of the stick. The Bowl Game - The Bowl Game was a favorite among the Iroquois and was traditionally played during the Midwinter Festival. For this game a wooden bowl was used along with six nuts that were black on one side and white on the other. The nuts were placed inside the bowl. Then the player hit the bowl against the ground. If at least five of the six nuts ended up the same color, that player gained a point. 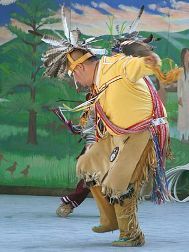 Music and dance were important parts of the Native American culture. Songs were sung at important religious rituals, but were also part of everyday life. They believed that music was the language of the spirits. Different tribes had different styles of music and instruments. The most important aspect of Native American music was singing, chanting, and percussion (i.e. drums). Traditional instruments included drums, rattles, whistles, and flutes. There were also a large variety of traditional dances. Each dance had its own special name, steps, songs, history, and meaning. Some dances included both men and women while other dances were exclusively for one or the other. Many of the dances involved the dancers moving in a circle. Sometimes the dancers would dress up in costumes and/or masks. Medicine men often acted as coaches for the lacrosse teams. There was a version of lacrosse that the women played called amtahcha. Rattles were sometimes made with turtle shells or buffalo horns. Gambling games were very popular and the stakes were often high. Sometimes players would wager valuable furs or even a horse. Many songs would start off slowly, but would pick up the tempo further into the song. Sometimes songs were considered personal and could only be performed by another person if the writer gave their permission.